Donna Scott Productions and the Charlotte Art League are celebrating the holidays with their 4thannual Tacky Holiday Party now in their new space at the Station House in NODA at 4100 Raleigh Street. Featured family friendly events of the evening include a holiday themed interactive improv comedy show, tacky sweater contest and holiday photo booth. Doors will open to the gallery space for a juried art show and sale at 6:00pm, Improv Charlotte comedy show starts at 8:00. In addition for 2017 Donna Scott Productions will continue spearheading the 4th year of the #CltArtsGivesBack campaign where we collaborate with other local partners and arts groups to support Kids 1st of the Carolinas (http://kidsfirstofthecarolinas.org) a grass-roots local non-profit that helps children and families in need around the holidays. This year we will be collecting new unwrapped children’s toys and clothes at 4 #CltArtsGivesBack locations across the city. Restaurant opens at 4 pm for appetizers, dinner and pre-show drinks! 1st Donna Scott Productions Short Playfest 2018! Thank you to all that submitted! Donna Scott Productions in Charlotte, NC is seeking submissions for their first short play festival. The DSP Short Playfest will be held May 18 -19, 2018 to help celebrate the opening of our partner the Charlotte Art League in their new home at­­­­­ Station House in Noda at 4100 Raleigh Street Suite A. The festival will consist of two nights of staged readings of the selected plays where directors and actors will bring the stories to life for audiences. By submitting your play, you are agreeing to allow your play to be presented and produced as a reading at the festival. Audience Choice winner will receive a $100 prize. Submissions must meet ALL of the guidelines below for consideration. -Plays must deal with the subject of art in some form. -Plays must contain a central female character and allow for racially diverse casting. -Plays should not exceed 15 minutes in length. -Scripts should be sent as a pdf. -Please include your name and contact information on a separate file than your entry (to allow for blind judging) with title page/contact sheet including name, address, email and phone number. -The playwright’s name should not appear anywhere in the body of the script. Donna Scott Productions is holding its 3rd Annual Holiday Party with Improv Charlotte to benefit Kids 1st of the Carolinas and the Relocation Fund for the Charlotte Art League! CHARLOTTE, N.C. Nov 16, 2017 – Are you ready for some holiday fun in South End?! 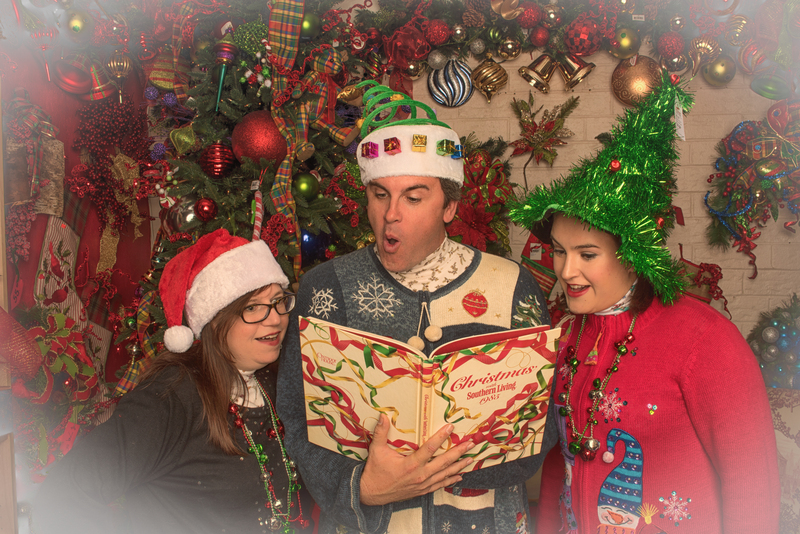 In less than a month, Donna Scott Productions and the Charlotte Art League will celebrate the holidays with their third annual Tacky South End Holiday Party, complete with an Improv Comedy show, tacky sweater contest, and holiday photo booth starting at 9:30PM after the South End Gallery Crawl at 1517 Camden Road on December 1, 2017. The featured event will be an improv comedy show by local favorite troupe, Improv Charlotte (improvcharlotte.org) starting at 9:30PM, at the Charlotte Art League at 1517 Camden Road. Improv Charlotte performs family friendly, audience interactive comedy, and everyone is welcome! Admission is FREE with RSVP HERE: http://bit.ly/2fsB839 AND a new child’s toy for our Kids First of the Carolinas (or suggested $10 donation). All proceeds from this event will go toward the Charlotte Art League Relocation Fund. In addition for 2017 Donna Scott Productions will continue spearheading the 3rd year of the #CltArtsGivesBack campaign in which we collaborate with other arts groups and support Kids 1st of the Carolinas (http://kidsfirstofthecarolinas.org) a local, grass-roots non-profit that helps children and families in need around the holidays. This year we will be collecting new, unwrapped children’s toys and clothes at 4 #CltArtsGivesBack locations across the city and we suggest you support these holiday shows from our participating groups and bring a new unwrapped toy along for easy drop off! The ASC gets a Sneak Peek at Eat the Runt! Tickets for Eat the Runt On Sale Now! IMPOSTER SYNDROME is a very real fear that plagues artists, entrepreneurs and new small business owners alike, many times freezing them in their tracks and stopping their progress. How do we push through this common fear to achieve success? Valaida Fullwood brings her success story of writing for years but not considering herself a Writer, pushing through and writing her book “Giving Back” and then turning that into a touring museum exhibition that opened Feb 2015: “Giving Back: The Soul of Philanthropy Reframed and Exhibited” for which she currently serves as vision keeper and principal architect. Described an “idea whisperer,” Valaida Fullwood brings unbridled imagination and a gift for harnessing wild ideas to her work as a writer, public speaker and consultant on various projects and events in the philanthropic sector. Her client base ranges widely and her interests center on social innovation in philanthropy, education and the arts. In short, she helps people and organizations drive bold ideas forward by guiding their projects and by writing their stories. Valaida is the award-winning author of Giving Back, a 400-page hardcover book profiling stories of philanthropy among African Americans that was developed with photographer Charles Thomas. “Giving Back,” her first book, was named one of the 10 Best Black Books of 2011 and received the prestigious 2012 McAdam Book Award, which recognizes “the most inspirational and useful new book for the nonprofit sector. A born-and- bred North Carolinian, Valaida has deep hometown roots in Morganton and is a graduate of the University of North Carolina at Chapel Hill, where she majored in International Studies with a focus in Economics. Providing a completely novel and participatory theatre experience for Charlotte audiences, Eat the Runt requires that all eight actors in the cast learn every role and audition for the audience before each performance. The audience will cast the show using their smartphones and watch as the actors they cast deftly play out one of the over 40,000 possible casting combinations. that will never be the same show twice. from The Arts and Science Council. June 12: Get involved or STFU! CHARLOTTE, NC, May 17, 2017– The 2nd 2017 installment of the Donna Scott productions Women Entrepreneurs in Business and Arts Speakers series will be ‘Get involved or STFU!’ featuring Charlotte community leader Lesa Kastanas. This event will be held on Monday June 12, 6:30-8pm at the Charlotte Art League, 1517 Camden Road in South End. This event is free and open to the public but seating is limited and RSVP is required: http://bit.ly/2qwtg4s. Would you like to get involved in your community or neighborhood but don’t know where to start? Do you crave being a part of a group of passionate people that don’t just talk but actually get things done? Have you wished you felt more connected to your community? Charlotte native, serial entrepreneur, community organizer and Lesa Kastanas says “If you’re not willing to change it, stop f’n complaining about it!” This has been her motto throughout her life in Charlotte, opening multiple businesses, raising money for local causes like Rain Charlotte and Planned Parenthood South Atlantic, investing in the growth of neighborhoods like Plaza Midwood and creating unique events that have connected Charlotte’s most creative and passionate along the way. Our candid conversation with Lesa is sure to light a fire with anyone who has wondered whether or not one person can truly make a difference. Eat the Runt, a ‘play without pronouns’ is a satirical piece which turns its sharp eye on political correctness, office politics, sexual harassment, religious persuasions, and societal and cultural norms. The eight diverse actors learn every part and don’t know which role they will play until the audience decides for them at each performance. The actors forge their own unique interpretations in any one of the 40,320 possible casting combinations that could confront them, creating a unique and hilarious interpretation of the show every night. All roles are compensated. Tonya Bludsworth will direct. Auditions will consist of cold reads from script playing multiple characters. Seeking actors that can make bold and unique choices and are enthusiastic about the opportunity of playing a different role each night. Please bring headshot and resume to auditions. Please email donnascottproductionsinfo@gmail.com for an audition time or with any questions. When you email, please state if you have an audition date preference. Women Playing Hamlet Featured in C5! Donna Scott sat down with Joanne Spataro for Charlotte Five to discuss our most recent production, feminism, and being a female actor in Charlotte. Check out the whole article here: Charlotte Five Article. CHARLOTTE, NC — The 2016 political season was inspirational and/or motivational, depending on which way your personal politics lean. The outcome of the presidential election ignited a spark in Lauren Gunderson, creator of “The Taming,” a satirical, feminist play that addresses political and gender stereotypes on the backdrop of the Miss America Pageant. The playwright announced she’d waive staging fees for her political farce for any company if they staged a reading of the piece on Jan. 20, 2017 — Inauguration Day. Charlotte’s Donna Scott Productions jumped at the opportunity. The free reading is scheduled for 7p.m., Friday, Jan. 20 at Charlotte Art League, 1517 Camden Rd., Charlotte. DSP had included “The Taming,” in it’s Spring 2016 lineup, not knowing at the time just how prescient that decision would be. The Charlotte Inauguration Day staging will feature the March 2016 cast reprising their roles: Glynnis O’ Donoghue as Bianca/Pinckney, Katherine Drew as Catherine, Donna Scott as Patricia/Madison. was a huge hit! Did you miss it? If you missed the event, check out some of Rachel’s tips for cutting the bullsh*t and selling your strongest self in this piece by Katie Toussiant from CharlotteFive! Thank you everyone who came. Be sure to follow us on all social media platforms to keep up with what we’re doing next! Do you find it easier to talk about all the things your counterparts and friends are doing rather than your own business, artistry or non-profit? Do you find that you can sell the heck out of something you’ve found that really love but find it difficult to speak succinctly when the topic turns to you and the things you are doing? Charlotte public relations expert Rachel Sutherland has been there, but emphatically says “Get over it!” Learning to speak strongly and clearly about what you love and what you do is imperative to the success of your brand and your business. In this question and answer style interview session Rachel will provide actionable takeaways that you can start instituting now to help you cut the B.S. and sell your strongest self, always. Before founding Rachel Sutherland Communications, Rachel was a journalist for more than 13 years, most recently as the Style Editor at the Charlotte Observer, the largest daily newspaper in the Carolinas. RSC was launched to help lifestyle brands and nonprofits streamline their stories using marketing strategy, branding, social media and public relations. RSC has worked with Vineyard Vines, Studio C, Habitat Metrolina ReStores, Project One Scholarship Fund, Shine Salon, Cupcrazed and fashion stylist Erica Hanks, among others. Her clients have been featured in the pages of Southern Living, Food & Wine and Oprah Magazine, as well as on The Food Network and The Today Show. Due to circumstances beyond our control we must cancel our fall show Shooting Star at the Charlotte Art League, Sept 8-24. Oct. 17: DSP Women in Business and the Arts Speakers Series: Selling Your Strongest Self with Rachel Sutherland of Rachel Sutherland Communications. 6:30p, The Charlotte Art League, 1517 Camden Road, Ticketing information to come soon. Dec. 2: Second Annual South End Holiday Party at the Charlotte Art League to benefit Kids 1st of the Carolinas with Improv Charlotte after the South End Gallery Crawl. Ticket information to come soon. CHARLOTTE, NC, July 5, 2016 – Donna Scott Productions is proud to announce the DSP Women Entrepreneurs in Business and Arts Speaker Series. This series will explore the opportunities, successes and challenges of being a savvy entrepreneur and will be focused on women in Charlotte, NC and surrounding area. The goal of the series will be informal networking along with educational sharing of information from experts in their field. The 1st event will be held in conjunction with the Charlotte Art League at their space at 1517 Camden Road in South End. Creative Loafing is the series media sponsor and Treehouse Kitchen (The Summit Room, The Mayobird, The Pack House and Joe and Nosh) is the wine and food sponsor for the series. The first installment in the series will be on Monday July 25 6:30-8pm and the topic is ‘Non-Traditional Spaces and Partnerships: How to Make them Work For You.’ This session will be a panel discussion moderated by Anita Overcash, Editor of Creative Loafing. The panel will consist of 3 examples of successful business/arts collaborations: Suzie Ford(NoDa Brewing) and Sheila Proctor (Chickspeare), Carolina Cook- Frers (Frock Shop) and Nicia Carla (Paperhouse Theatre Company) and donna scott (donna scott productions) and Cindy Connelly (Charlotte Art League) and will be focused around the benefits of a shared space partnership using a pop-up model. The event is free and open to the public but seating is limited to RSVP is required: http://bit.ly/28ZsNAa . The second event in the series for 2016 is Monday, October 17 and will feature Public Relations expert Rachel Sutherland of RS Communications. Donna Scott Productions celebrated its 10-year anniversary in 2015 with a successful series of theatre events designed to bring live theatre back to the Historic South End neighborhood of Charlotte and in 2016 was named the resident theatre company of the Charlotte Art League. Five events were offered with audiences and comedy The Book of Liz won Creative Loafing’s Best Theatre Show of 2015 and South End being dubbed “The New Arts District of Charlotte” with the addition of theatre by Charlotte Magazine. Event is produced with the help of our sponsors, Sleepy Poet Antique Mall, Next Stage Consulting and Triple C Brewing Company. The Show Must Go On for Women in Theater! We loved being a part of this article about Charlotte women in theatre for Creative Loafing Charlotte along with PaperHouse Theatre, FROCK Shop, Chickspeare, NoDa Brewing Company & Paige Johnston Thomas for Theatre Charlotte- and big thanks to Page Leggett! ‘The Taming’ is Political Hilarity! “Wherever your political leanings take you, this show offers both humor and hilarity, along with more than a soupçon of history.” Thank you so much to Lydia Arnold for coming out to review our show! Read the whole thing here. Check out this great preview of our timely political comedy in the Charlotte Observer! Page Leggett gives a sneak peak into this hilarious show and some insight into our fabulous playwright, Lauren Gunderson. Read the whole article here – get your tickets here! Glynnis O’Donoghue, Katherine Drew, and Donna Scott in The Taming. Photo by Weldon Weaver, Gown by Pixton Design Group. Check out this fantastic interview where our playwright Lauren Gunderson dishes about The Taming and Shakespeare, current political rhetoric and the value of farce to Charlotte View Point. Read it here and grab your tickets here! We’re featured on Historic South End’s blog! Thanks for helping us get the word out about our upcoming show. We love producing theatre in this part of town! Read the post here. CHARLOTTE, NC March 16, 2016 – Donna Scott Productions and the Charlotte Art League announce their official ongoing partnership in South End to produce live theatre events in 2016. Donna Scott Productions, the resident theatre company of the Charlotte Art League, will present The Taming by Lauren Gunderson as its 2016 spring show. The political comedy will open March 31 and run through April 16 at the Charlotte Art League. Tonya Bludsworth will direct. Tickets available through CarolinaTix.org and are $22 in advance: http://bit.ly/1Sd8Ab2 and $25 at the door. The Taming, a satirical farce that addresses political and gender stereotypes on the backdrop of the Miss America Pageant, was deemed “a laugh riot with food for thought’ by the San Francisco Chronicle. Lauren Gunderson was named in the top 10 of American Theatre Magazine’s most produced playwrights of 2015 and was the recent recipient of the Dramatist Guild of America Award. This will be her inaugural Charlotte production. Ms. Gunderson will make herself available for interviews via special request; please inquire for appointment. Donna Scott Productions celebrated its 10-year anniversary in 2015 with a series of theatre events designed to bring live theatre back to the Historic South End neighborhood of Charlotte. Their first 2015 event was a reading of Carrie Ann’s Kiss by Charlotte playwright and Donna Scott Productions’ Co-producer Tonya Bludsworth, held at the Charlotte Trolley Museum in January. The spring show was a fully staged production of Shiloh Rules by Doris Baizley, held at the Charlotte Art League in March 2015. The August show was the David and Amy Sedaris’ Comedy The Book of Liz, directed by Donna Scott Productions’ Co-producer Glynnis O’Donoghue in the same space, which ran for eleven shows, brought sold out audiences to the Charlotte Art League and won Creative Loafing’s Best Theatre Show of 2015. A Backwards Broadway collaboration with Theatre Charlotte (as part of their Grand Nights for Singing Series) had a standing room only audience in September, and a sold out collaboration with Improv Charlotte for a holiday event brought new audiences to the Charlotte Art League and South End. The pop-up theatre experience at the Charlotte Art League includes an active intermission during which the audience gets to shop the galleries for visual art from local Charlotte artists; 97 pieces of art were sold in 2015 as a result of the collaboration between Charlotte Art League and Donna Scott Productions in South End. Donna Scott Productions is celebrating a year of successful theatre events in South End with a holiday party that includes Improv Charlotte at the Charlotte Art League, one night only and FREE! CHARLOTTE, N.C. Nov 18, 2015 – How do you celebrate a successful year of bringing live theatre back to the Historic South End neighborhood in 2015? With a big party of course! And we’re inviting all of Charlotte to come check it out for FREE! 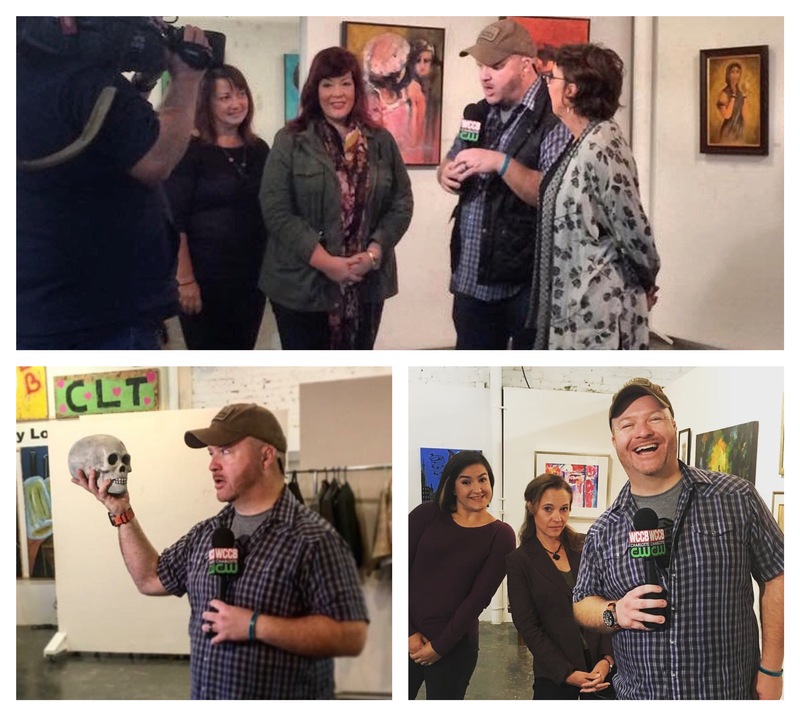 In addition Donna Scott Productions has facilitated the 1st #CltArtsGivesBack campaign where four Charlotte arts group have collaborated to support our charity around holidays: Kids 1st of the Carolinas, a grass roots local non-profit that helps children and families in need. (kidsfirstofthecarolinas.org). We will be collecting new unwrapped children’s toys and clothes at three #CltArtsGivesBack locations: Charlotte Art League (1517 Camden Road), Theatre Charlotte (501 Queens Road) and Actors Theatre (605 E Stonewall) until December 15. Please help us support children in need by bringing a new unwrapped toy or clothing item to donate. Donna Scott Productions is celebrating its 10-year anniversary with a series of theatre events designed to bring live theatre back to the Historic South End neighborhood of Charlotte in 2015. Their first 2015 event was a reading of Carrie Ann’s Kiss by Charlotte playwright Tonya Bludsworth, held at the Charlotte Trolley Museum in January. The spring show was a fully staged production of Shiloh Rules by Doris Baizley, held at the Charlotte Art League in March 2015. The August show was the David and Amy Sedaris’ Comedy The Book of Liz in the same space, which ran for eleven shows, brought sold out audiences to the Charlotte Art League and won Creative Loafing’s Best Theatre Show of 2015. The third event was a free event, a Backwards Broadway collaboration with Theatre Charlotte as part of their Grand Nights for Singing Series that had a standing room only audience in September. The pop-up theatre experience at the Charlotte Art League includes an active intermission where the audience gets to shop the galleries for visual art from local Charlotte artists at the performances; 85 pieces of art have been sold in 2015 so far as a result of the collaboration between Charlotte Art League and Donna Scott Productions in South End. The Book of Liz Named ‘Best Theater Show of the Last 12 Months’ by Creative Loafing! We were thrilled to learn that our production of The Book of Liz was named the “Best Theater Show of the Last 12 Months” by Creative Loafing in their “Best Of” issue! They also picked the brain of our founder and fearless leader, Donna Scott about her picks of Charlotte’s best! See her feature here. For the full list of winners, check out Creative Loafing’s site! Donna Scott Productions on a South End Heater! We are so excited to be featured on Historic South End’s blog! HSE writes that “In the past year alone, DSP has made a splash in the South End arts scene with a growing portfolio of successful pop-up theatre performances in unexpected locations, each one bigger and better than the last.” To read the full article, visit their blog here! Thank you so much, Historic South End – we wouldn’t be able to make all of this happen without a great community partner like you! Donna Scott Productions Collaborates with Theatre Charlotte and Charlotte Art League to bring Backwards Broadway Event to South End- one show only! CHARLOTTE, N.C. August 18, 2015 – Donna Scott Productions is celebrating its 10-year anniversary with a series of theatre events designed to bring live theatre back to the Historic South End neighborhood of Charlotte in 2015. The group is collaborating with Theatre Charlotte’s Grand Nights for Singing to present a one-show-only “Backwards Broadway” musical revue on Saturday September 19 at 2pm at the Charlotte Art League at 1517 Camden Road. The event has a cast of some of Charlotte’s best voices and is free and open to the public as a part of the Arts and Science Council’s Connect with Culture event series. Doors will open at 1pm so that audience members can browse the galleries pre-show. Backwards Broadway is an exhilarating and spirited performance featuring men singing show tunes traditionally sung by women, and women singing show tunes traditionally sung by men. This gender-bending performance celebrates musical theatre in a unique way. The cast includes: Dani Burke, Chris Chandler, Abby Corrigan, Kayla Ferguson, Jenn Grabenstetter, Ben Henley,Vivian Tong Howell,Matt Kenyon, Marvin King, Meredith Owen, Megan Postle, Kevin Roberge, Tyler Smith with Music Director, Zachary Tarlton! Donna Scott Productions’ first 2015 event was a reading of Carrie Ann’s Kiss by Charlotte playwright Tonya Bludsworth, held at the Charlotte Trolley Museum in January. The spring show was a fully staged production of Shiloh Rules by Doris Baizley, held at the Charlotte Art League in March 2015. The August show was the David and Amy Sedaris’ Comedy The Book Of Liz in the same space, which ran for eleven shows and brought sold out audiences to the Charlotte Art League. A part of the experience at the Charlotte Art League is an active intermission where the audience gets to shop the galleries for visual art from local Charlotte artists at the performances. These events were co-produced with Historic South End and made possible in part with a grant from the Arts and Science Council. South End neighborhood businesses Triple C Brewing and Common Market provided product sponsorship and marketing support. Donna Scott Productions seeks to provide creative opportunity for audiences, artists and collaborating partners to participate in unique and engaging theatre in Charlotte. For more information about the 2015 offerings please check www.donnascottproductions.com for details. This project was made possible, in part, with funding from the Arts & Science Council. Thanks so much to Perry Tannenbaum for coming out and laughing with us! On Broadway World.com he writes that “…the whole story turns out to be very much like a secret recipe revealed.” For the complete review, click here! The first event was a staged reading of the critically acclaimed play Carrie Ann’s Kiss by Charlotte playwright Tonya Bludsworth, held at the Charlotte Trolley Museum in January. The follow-up effort was the fully staged production of Shiloh Rules by Doris Baizley, held at the Charlotte Art League in March 2015. These events were co-produced with Historic South End and made possible in part with a grant from the Arts and Science Council. The excitement over having theatre back in the neighborhood has engendered many community partnerships. A Charlotte Art League artist Ráed Al-Rawi has provided set painting for the show and community partners TripleC Brewing and Common Market are back as beer and wine sponsors. A cheese ball contest will also be a part of the August 6 opening night festivities with Savory Spice Shop, Beverly’s Gourmet Foods, The Common Market South End, Chef Alyssa’s Kitchen and The Mayobird contributing entries that the opening night audience will get to sample at our post show party. DSP Makes the Queen’s List! We are so thrilled to be chosen for Today’s Charlotte Woman’s Queen List! And we love being in the issue with brilliant Historic South End Charlotte creative Varian Shrum! Pick up the August/September issue all over Charlotte, or check out their website. DSP featured in Charlotte Five! Katie from Charlotte Five came and got a sneak peek of our set and chatted with us about the life lessons you can learn from “The Book of Liz.” She even got to meet Mr. Cheese Ball (he seemed to like her a lot)! Check out the complete article here! A huge thank you to Anita Overcash of Creative Loafing for this write up about “The Book of Liz” and the changing climate of the theatre scene here in the Queen City. Read the whole article, here! The DSP3 Get Cheesy With Wilson! On Tuesday, 8/6, the DSP3 joined Wilson of Wilson’s World as he previewed The Book of Liz, explored the Charlotte Art League, and judged our local cheese ball contest! Catch the whole video here! A huge thanks to the great ‪#‎cltlocal‬ businesses that made the delicious cheese balls: Beverly’s Gourmet Foods, Savory Spice Shop • Charlotte • South End/Dilworth, Common Market, Chef Alyssa’s Kitchen, & The Mayobird! We were lucky enough to have journalist Kim Lawson attend one of our ‪rehearsals during July. In her preview of The Book of Liz for Charlotte ViewPoint, part of the Charlotte Arts Journalism Alliance (CAJA), she really did a wonderful job of capturing what it’s like producing pop-up theatre in South End. Read her whole preview here. Check out this fantastic preview of our upcoming production “The Book of Liz” in Sunday’s Charlotte Observer. Page Leggett sat down with us to talk about the show, comedy, and (of course!) cheese balls. Read the whole article here! The Book of Liz tops Charlotte Agenda’s Theatre Picks! “The Book of Liz” tops Charlotte Agenda’s August list of theatre picks in Charlotte. Collin Beck says that “theatre is popping-up everywhere” and we couldn’t be more excited! Check out the great sampling of shows here! On Friday, July 23rd, Donna Scott joined Ryan Deal of the Arts and Science Council and co-producer Tobe Holmes of CCP Historic South End on Charlotte Talks with Mike Collins. They discussed the work that we’ve been doing in South End, as well as the general theatrical climate in the Queen City. Missed the broadcast? Check it out here! donna scott productions was recently featured in a great piece by Collin Beck of Charlotte Agenda. Beck writes: “Is Historic South End the new Arts District? With movers and shakers like Donna Scott Productions and Charlotte Art League, it may soon just be the place to see innovative theatre.” We’re so thrilled to help spread local art through out great city! Read the whole article here on Charlotte Agenda. The reviews are in – Shiloh RULES! We’re so grateful to all the publications and reviewers who supported our first fully staged production, Shiloh Rules. Check out the reviews and articles below! Mark Pizzato of Charlotte Viewpoint says that our production can work “… magic on the Charlotte audience, evoking laughter and insights…” For the rest of the review, click here. Creative Loafing is one of our favorite Charlotte publications – read Perry Tannenbaum’s review of our “historic” production here. Lawrence Toppman writes in the Charlotte Observer that “There are many remarkable things about ‘Shiloh Rules. '” See the rest of his review here. Our own Donna Scott was named one of Creative Loafing’s “People to Watch in 2015,” and we couldn’t agree more! Emiene Wright’s article profiles our company’s founder and gives you a taste of what we’re planning for the year! Full article here. Page Leggett of the Charlotte Observer profiled our company right before our staged reading of Carrie Ann’s Kiss and really captured the spirit of what we want to accomplish with our work. We love her and this piece – read it here! John Schacht at Charlotte Viewpoint wrote an amazing article about our company and how we fit into the creative history and community of Charlotte. Read the piece here. CHARLOTTE, N.C. February 23, 2015 – Donna Scott Productions is celebrating its 10-year anniversary with a series of theatre events designed to bring live theatre back to the Historic South End neighborhood of Charlotte in 2015. A full production of the historic comedy Shiloh Rules by Doris Baizley will run March 5-14 at the Charlotte Art League on 1517 Camden Road in Charlotte. The Charlotte Art League celebrates its 50th of the Monthly South End Gallery Crawl and Food Truck Friday. (HistoricSouthEnd.com) Tickets are $25 in advance from CarolinaTix.org: http://bit.ly/1BVVx3N and $27-32.50 at the door on the night of the event. There will be an accompanying gallery show featuring historical sites from North Carolina. Photographs by Charlotte artists Marcee Musgrove and Rob Yaeger will be on display at the Charlotte Art League during the month of March to coincide with the show.